Click these links for THREE important printouts! If you can believe in this plan you can achieve a wealthy income in 24 to 48 months. Every town around the world has someone looking to make a wealthy income, six figures up to one million dollars each year or more. Sharing this website, A Great Future Starts Here, can help anyone reach their success by helping you reach your own success. 1. People without leverage pay big money with less time freedom to enjoy the things they love to do. 2. People with leverage pay little money with more time freedom to enjoy the things they love to do. What makes the dollar weak or strong? Read step 9 of the 10 step plan. Many people are tired of paying the high prices, and looking for more options to pay the lowest prices. Looking for better ways to make a living. How to keep the cost of living low and the same price for the broke, and the wealthy? How and Why, the same $5.00 that keeps you broke can keep you wealthy? 1. What is the average cost of living today, $ __________ each month? divided by 30 days, equals $ __________ each day? minus $5.00 each day for the new low cost of living tomorrow, equals $ __________ each day? You can see that people have the $5.00 a day, it's the leverage that is missing in the $5.00 a day for broke people. 2. What is the average time at work today, __________ work hours each week? times 52 weeks each year, equals __________ work hours each year? times 40 years, equals __________ work hours in your life time to live broke or wealthy? Three Reasons, Why, people have interest in this plan. 1. Looking to pay little money with more time freedom to enjoy the things they love to do. 2. Looking for the lowest price to pay, $5.00 a day, buying with leverage. 3. Looking to replace the 40 hour work week for 40 years with in 24 to 48 months with the new 40 year plan for Residual, and Retirement income to enjoy time freedom. Print out the Million Member Interview and the 10 step plan and fill in the blanks. This plan can inspire you to spend your time where you want, and earn a six figure income with one income. If there is any DOUBT, would you agree trading our time at work for $10 an hour on average or having a few customer dollars at work each day to earn $10,000 each month or more are two very different opportunities? Having an opportunity that anyone can achieve is the answer to having success. Today most every household wakes up to their alarm clock to drive to and from work in rush hour traffic to make $10 an hour on average. Many are sitting or standing on their feet for 8 hours or more for 5 days each week. This is causing loss of good health! What will your raise be for all that hard work this year? burns across the country like crazy then goes away. 1. No one works 40 hours each week. 3. The 24 month goal is to have 4,096 members. 4. 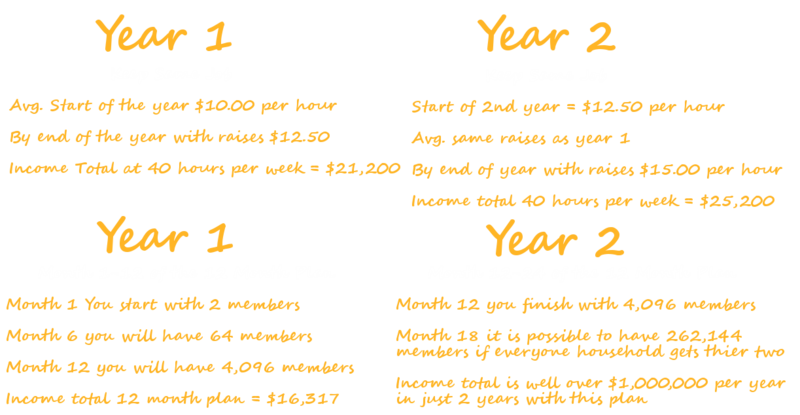 Each member buys a few dollars a day $1, $2, or $3 times 4,096 members each month. 5. The number you come up with is your business each month. To really understand how this works long term take a look at the next four slides. Major Growth starts during month 12 . This plan is using information based on a $2.00 plan. Remember you have the ability to choose how much you would like to spend. $1.00-$6.00. This is so you can really see how this works in dollars! One of the biggest points to understand here is that year one is what sets it off. From the 12th month in year one to the 24th month in year two is going to create that financial, and time freedom you have always wanted. Lets explore a different way to make money. It is time for GROWTH, STRATEGY, and FREEDOM! Take a look at those three sales tactics, and marketing patterns that happen with many of these companies. What this plan is offering is a long lasting financial solution, and within 24 months if you do the work all the time freedom one can imagine. Today, most people start their weekly paycheck over every 40 hours plus overtime. Most people get paid for their time at work Monday through Friday, and spend their customer dollars for free! The challenge is to get people to see the opportunity to get paid for their customer dollars or money at work, and spend their time free! Competition is taking away your income. Can you think of 2 businesses you would be able to go work for today that could potentially pay you $10,000 or more each month, and give you time freedom from work? 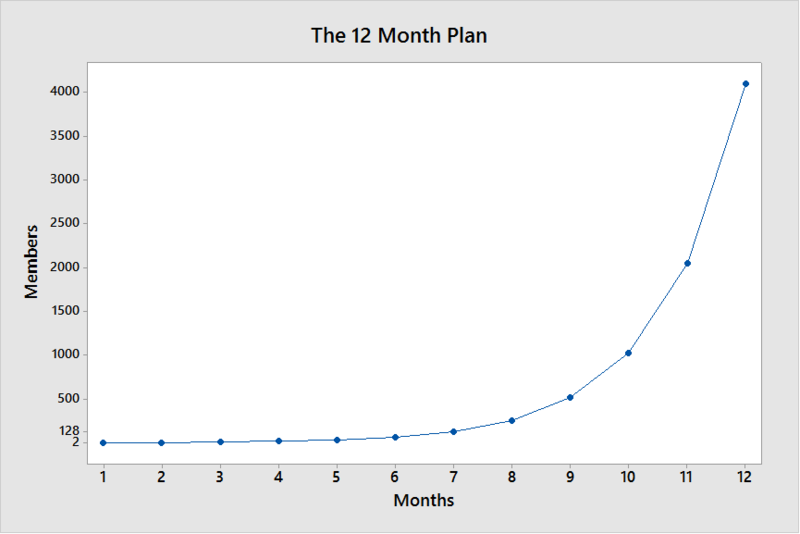 The strategy here is to have a 24 month plan to make $10,000 or more each month. How does this work you ask? Lets look at month 1 through month 24. Month number 1 and 2 is 2 people that can see the results in 24 months. In 24 months you have 4,096 people and growing. Everyone working on their income. The power of one household working with two households having a vision, and a belief to grow the six figure income with one income! Growing in month number 25. Every household works for residual income. Work you do one time, and get paid over and over for the life of that company. Growing the network in depth is the number one way to have stability, and grow the paychecks for each household. 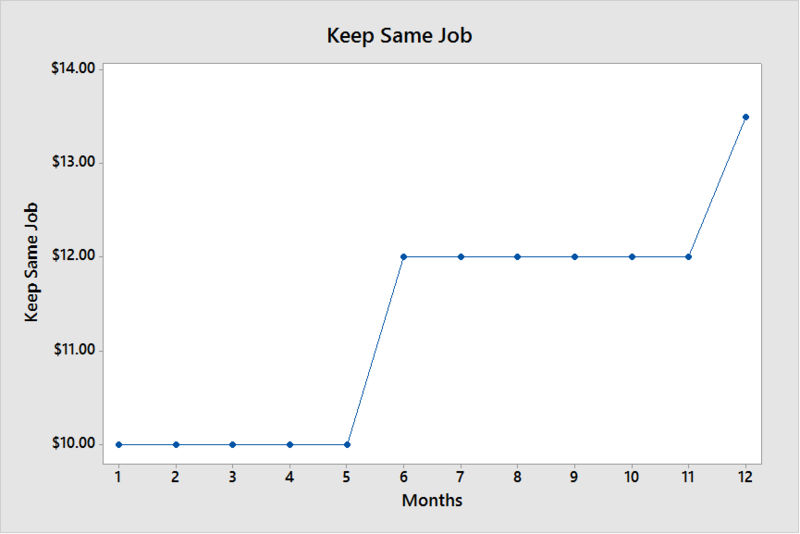 If you can see this long term you will understand even $10,000 a month is a small paycheck. When you learn the power of networking you can work for traditional business, or you can learn the power of networking like traditional business! Networking is the most powerful income! You have no employees, no payroll, and no over head to stock. Employees working for local business make $8.50 to $15.00 an hour on average can make more money networking than the local business owners! Two very different prices make all things possible for everyone rather than having one price for everyone making things possible for only a few. Price one: Everything you want with competition or without price control can cost you money each month. Price two: Everything you want without comepetition and with price control can cost just a few customer dollars each day. Replace the 40 hour work week Take home one income that can pay $10,000 or more each month. Drive a luxury vehicle, and enjoy a Carribean cruise anytime! Can you live without price control? Without price control, or a home based business every household is failing everytime they spend their customer dollars, or money without getting paid. How many times each day do you fail to make the decision to make $10,000 each month? Would you agree every house hold is spending their customer dollars each day? How to pay for high prices with more time away from work rather than more time at work. Do you think people want to? Trade more time at work to pay for higher prices? Get the BEST price by BUYING with price control to get paid? Before you start your own home business, do you agree with this motivation? If you could change one thing about your life, just one thing, would you want it to be free time from work, while your customer dollars(money) works for you? Lets Take a look at how the home business works! Do you know two people that you may be able to work with that want to make money WITHOUT standing on their feet or sitting for eight hours per day? All it takes is each household working with 2 other households. It can build up so fast when people really understand the power of this. It may sound crazy, or like the same old story but this is different than most people learn about in school or college. This is asking you to use your customer dollars, and the customer dollars of 2 other households, and those 2 get 2 households and it pays all the way back to you every single time someone new joins. 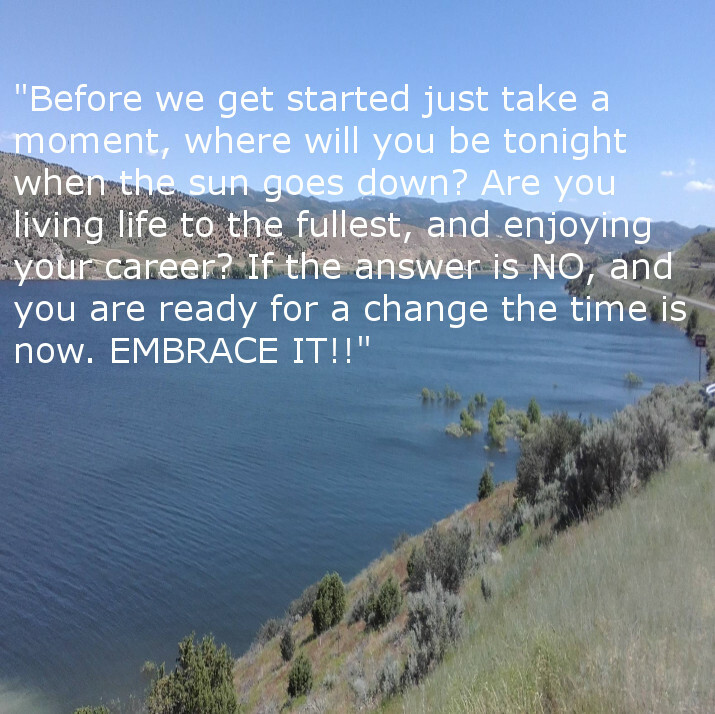 It is time for a change ARE YOU READY! ?